Christmas is fast approaching and one of our Christmas traditions is make our own Christmas goodies. And our usual routine, I'm in charge of the candies and my husband is in charge of the Christmas drinks. Glögg is a traditional Swedish winter drink made of red wine and some spices, it may or may not have alcohol and it's served warm. This yummy Christmas drink is always present on our table during the Yuletide season. It's very simple to make and it really smells like Christmas! Hope you enjoy our homemade recipe. 1) Heat the wine, brandy or vodka and spices in a pot over medium heat. 2) Let it simmer for 30- 45 minutes. Be careful not to boil the mixture. 3) Turn off heat and let it cool down before you separate the spices. 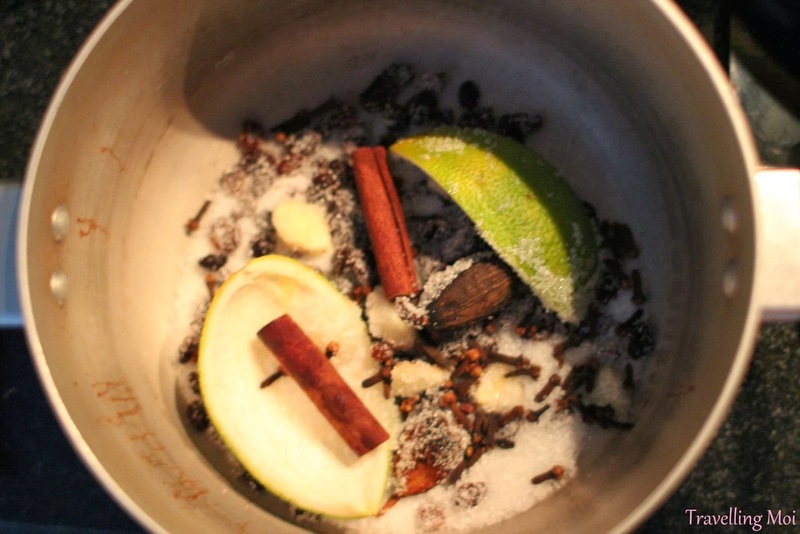 4) Strain the cooled glögg from the spices, pour into a bottle and recap. 5) Store in a cool, dry place. -To serve, pour glogg into a deep pan or pot and warm over low-medium heat until hot. -Serve glögg in a coffee mug, add raisins.